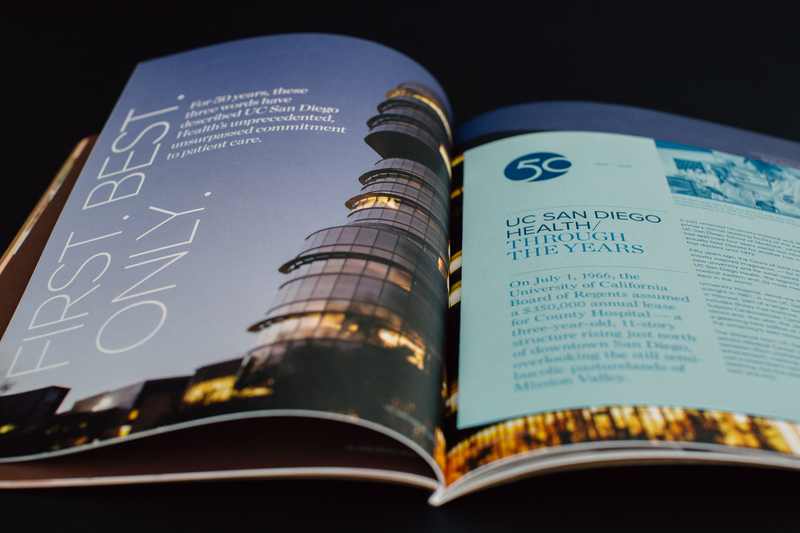 Discoveries Magazine shares stories of innovation in research and health care at the UC San Diego School of Medicine. The creative team at Traina Design was challenged to create a piece that invites the audience to engage. 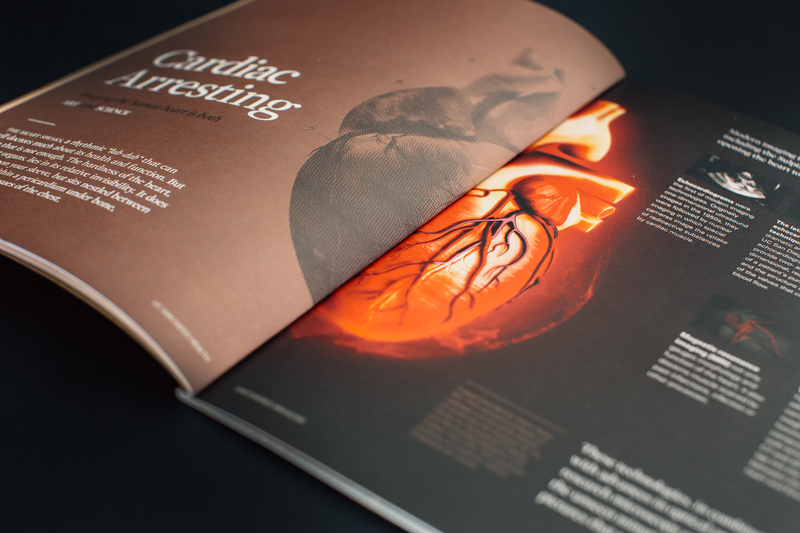 After winning a Gold Addy Award at the San Diego Creative Show and Silver Awards at the American Advertising Federations District AND National Addy Awards, we would have to say that they rose to the challenge. 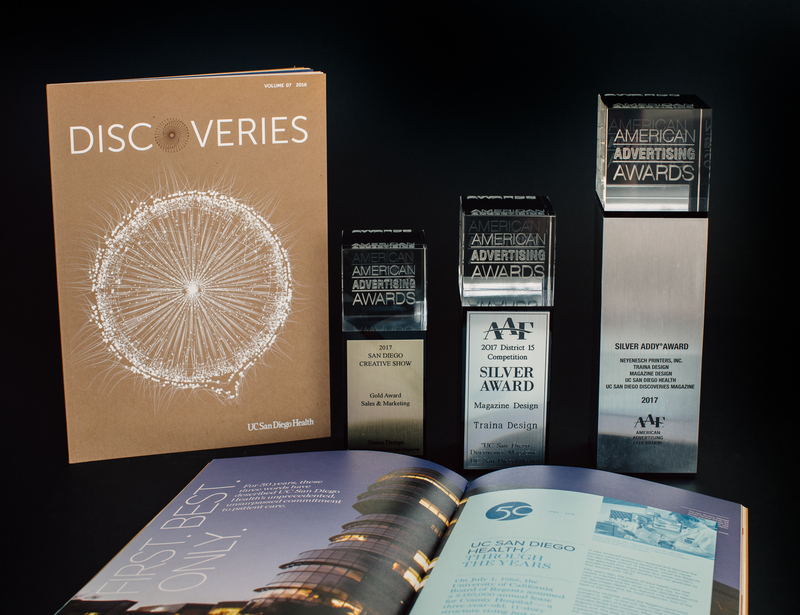 To put a bit of icing on the cake, Discoveries also won a Gold Award at the Association of American Medical College Awards. Thank you Traina Design and UCSD for your confidence in Neyenesch Printers. Forty pages plus cover with a 6 page roll-fold tip-in. PUR/perfect bound. Finished size: 8.25 x 11.625. Outside Cover: Opaque white pigment foil stamping and one UV cured custom match color. Inside Cover: Four hits of UV opaque white ink, one custom match color and black. Text: UV cured four color process, two sides. Six page insert: Two UV cured pms colors, two sides. Cover: 80 lb. Environment Raw Cover – Grocer Kraft. Text: 80 lb. Lynx Opaque Smooth Text. Six page tip-in: 70 lb. Earthchoice Opaque Text – Blue. White pigment foil on the front cover. Score the cover. Trim, fold and gather the text and PUR/perfect bind. Trim and fold the six page insert and spot fugitive glue to page 16. 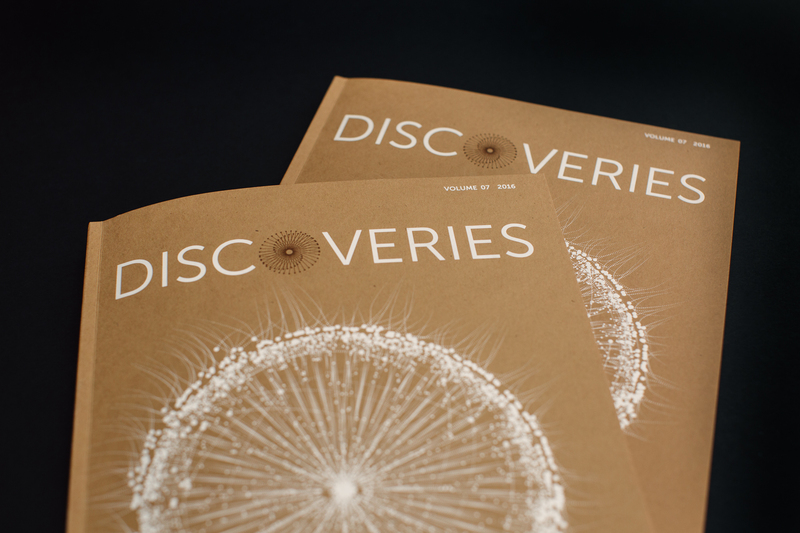 Discoveries Magazine was printed on our Eight Color Heidelberg Speedmaster LE-UV XL 106, Perfector using UV cured inks. Learn more about the advantages of UV printing . For the past six years, Traina has created Discoveries — a showcase of UC San Diego Health’s innovations in research and health care. 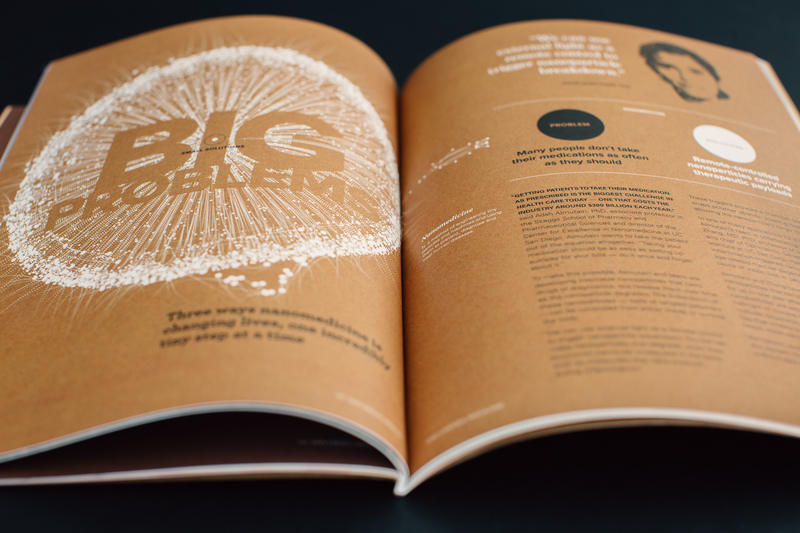 And for each of those six years, Neyenesch has brought our vision to life in print. But Discoveries is no typical book. 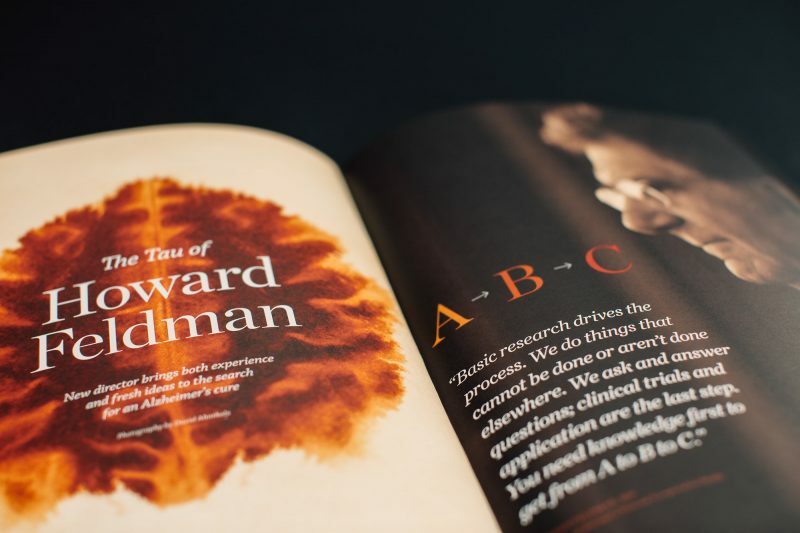 From intricate die cuts and foil stamps to custom stocks and edge gilding, each issue of Discoveries is a groundbreaking and technically demanding production. While most printers would turn and run, Greg Gaura and the team at Neyenesch have never blinked. 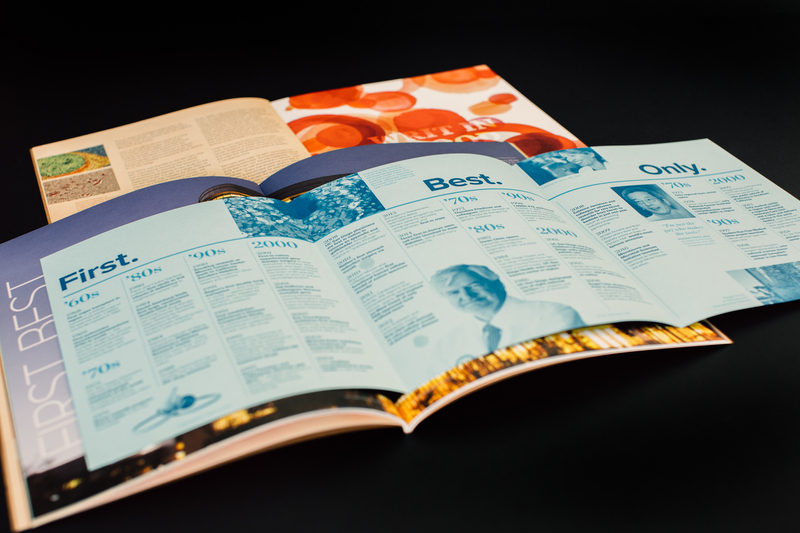 The results have been numerous best of show awards, appearances in international design publications, and most recently a National American Advertising Award (Addy). We’re grateful to have a partner like Neyenesch that shares our passion for courage, quality, and creativity.